The exterior of the burned-out Oakland warehouse. 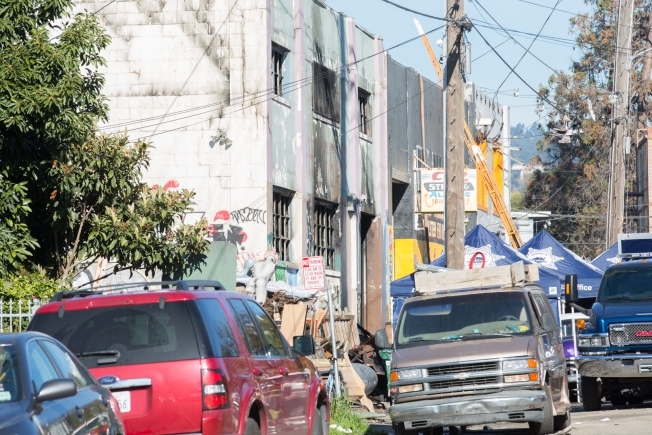 Oakland code enforcement officials blamed a chain link fence for blocking their view and preventing an investigation into a complaint against the so-called Ghost Ship warehouse building just weeks before the deadly fire at the warehouse, documents released Tuesday night show. Until now, city officials have provided little details as to what stopped the inspection of a complaint of a possibly illegal remodel of the building that was lodged in mid-November, other than to say they were barred access. But documents just released add a new wrinkle. They suggest the inspector was hoping the person who contacted the city would help the inspector get inside to verify the remodel. Instead, the city inspector took some pictures and wrote a citation letter to property owner Chor Ng informing her about the need to remove junk and debris that had piled up in the vacant lot next to the warehouse or face a fine of $2,665. She was given until January 16, 2017, to clean things up.